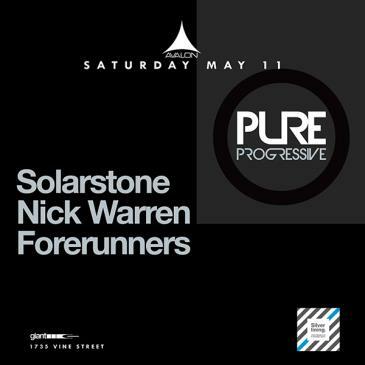 AVALON Hollywood welcomes back Solarstone, Nick Warren, and Forerunners on Saturday, May 11th for a Pure Progressive night full of eclectic tunes. Described as passionate and endearing, Solarston has already garnered a devout fan base, “for whom this music is a way of life”. Making their return exclusively at AVALON, the label brings a number of sets that challenge and represent the world famous genre. Founded by producer and DJ Solarstone, Pure Progressive takes prides in the genre’s legacy and anthemic sounds. Joining Solarstone is Bristol’s Nick Warren and Forerunners. Nick Warren’s reputation as a DJ and A&R frontman for Hope Recording has made him a staple in the house music scene. Playing across the globe at extravagant nightclubs almost every weekend and being the second half of acclaimed duo Way Out West, Warren is one of the hardest working and genre-defining producers in the game. His latest collaboration track with Israeli producer Guy Mantzur titled “Sad Robot” has received airplay and critical support from BBC6 and reached no. 4 on Beatport Techno chart. Join Solarstone, Nick Warren, and Forerunners at the AVALON on May 11th to witness a legendary night that will keep the dancefloor hot from open to close.